Join West Inishowen History & Heritage Society for this fantastic event relating to one of Inishowen’s most successful literary creations, Charles McGlinchey’s ‘Last of the Name. 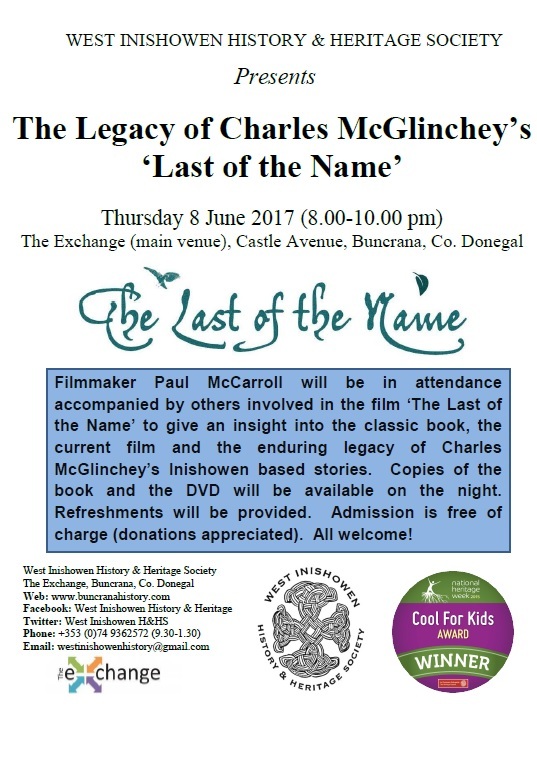 Filmmaker Paul McCarroll will be in attendance accompanied by others involved in the film ‘The Last of the Name’ to give an insight into the classic book, the current film and the enduring legacy of Charles McGlinchey’s Inishowen based stories. Copies of the book and the DVD will be available on the night. Refreshments will be provided. Admission is free of charge (donations appreciated). All welcome!